Jessie was in Portland, Oregon at saint cupcake, a delish little bakery. My man and I had dot cupcakes from saint cupcake for our wedding. mmmm mmm yummer! Perfect place for a sweet book tour. 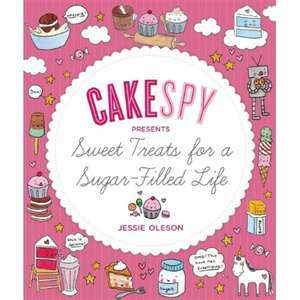 Jessie, like her recipes and drawings is sweet and adorable. It was a pleasure to meet and talk with her. I can't wait to visit her store in Seattle, Washington. ROAD TRIP! She not only signed my book she drew this sweet little unicorn in it! Weeee :) I highly recommend you check out her book tour and see if she's coming to a city near you. If so, high tail it down there and meet this adorable Cakespy!